Lifestyle diseases are now a common threat, particularly, among those working in the IT sector. It is said that many face health issues arising out of their lifestyle. Although majority of the problems are due to work related stress, Irritable Bowel Syndrome (IBS) can also be classified as a lifestyle disorder and many these days are affected by this. Some people have sensitive intestines. The food gets quickly digested and is not absorbed by the body. Irritable Bowel Syndrome is a functional disorder of the small intestine, characterized by abdominal pain, discomfort, followed by altered bowel habits (hard or soft bowels). Although structural abnormalities cannot be easily detected in such instances, it is one of the commonly diagnosed functional disorders of the digestive system. This illness causes great distress to patients and life becomes miserable with fatigue. Apart from physical reasons, psychological factors and mental stress also cause IBS. Over a period of time, many people tend to lose weight. The cause for IBS is denoted by combination of several factors like heredity, enteric infections, inflammatory action of small intestine, altered food habits, stress, depression anxiety, all of which play a major role in causing this disease. Ayurvedic classics point out reasons like fasting, excessive food intake, cold food intake, heavy food intake, dry and junk food, suppression of urges, improper sleep habits, anger, grief, fear, low digestion strength, travel, change in season, all being contributory factors to this disease. General symptoms of this illness may be isolated or combination of these – nausea, lack of appetite, delayed digestion, burning sensation, bloating, distention of abdomen, excessive thirst, fatigue, giddiness, gurgling sound in stomach. One of the cardinal features of IBS is occasional hard and soft stools. Ayurveda explains signs and symptoms of IBS-based on dominance of dosha. IBS in Vata predominant individuals – Usually associated with abdominal pain, increased frequency of stool, altered bowel habit, headache, distention of abdomen, debility, chest pain etc. IBS in Pitta predominant people – Burning sensation in the chest, belching, headache etc. IBS in Kapha pre-dominant people – mucus in stool, feeling of incomplete evacuation of the bowel, vomiting, nausea, heaviness of abdomen, flatus. Mixed features of all these doshas are also sometimes seen, accompanied by lack of concentration and severe debility. In this condition, all features of IBS like gurgling sound in abdomen, bowel with mucus, constant urge to pass stools, intermittent episodes, increase in frequency of bowel during the day are noticed. IBS is classified as IBS A (alternating diarrhea and constipation), IBS C (with constipation), IBS D (where diarrhea is predominant symptom). IBS D is a type of diarrhea that is triggered by stress and anxiety. Such a type of IBS should be treated with vata-balancing therapies and medicines. For IBS related with psychiatric aspects, the patient usually suffers from anxiety or depression. In such cases, along with efforts to restore digestive health, treatment for anxiety / depression should also be given. Ayurveda recommends treatments like ‘Shirodhara’ and ‘Pranayama’. In fact, regular pranayama practice is very beneficial in such cases, apart from maintaining regular sleep cycle, moderate exercise, yoga, stress management techniques etc. 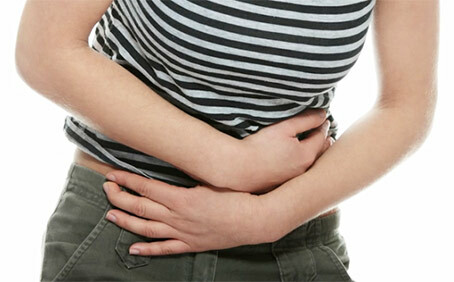 According to Ayurveda, IBS is treated with fasting, administrative of digestives and carminatives. Digestives like ‘Chitrakadi vati’ and ‘Shankha vati’ to eliminate enterotoxin is given, followed by administration of medicinal ghee preparations like Dashmuladi ghrita. Depending on the type of IBS, ‘Emesis’ or ‘Virechana’ is administered, followed by administration of herbs with spicy and sour tastes. Complex IBS is treated with Panchakarma line of treatment, supported by digestives and carminative preparations. Ayurveda recommends herbs such as Dhataki, Lodhra, Chavya, Daruharidra, Shalmali, Lajjalu, Musta, Bilva, Kutaja, Amalaki, coriander water, aloe vera juice, Guduchi, and pomegranate. Ayurvedic medicines such as Mustakarishta, Pippalyasavam, kutajarishta, Dantyarishta, Sanjeevani vati, Jeerakarishtam, Kamdudha Ras, Bilvadi gutika, Chitrakadi vati, Brihat gangadhara choorna, Bilvarishta, Takrarishta are recommended. Ayurveda recommends regular intake of butter milk, cumin seeds, pomegranate, easy to digest foods, proper sleep, moderate exercise and fiber-rich diet to relieve symptoms. Basically, go easy on your intestines. Minimize fried foods, meats, oil, dairy foods and other fatty foods, as they cause colon to contract violently, which can lead to abdominal pain and diarrhea. Do not eat spicy foods, as they trigger spasms in your intestines leading to diarrhea. Have soluble fibre, and foods like beans, oatmeal, apples, strawberries and grapes. Drink 2 litres of water a day. Ginger intake is good. Practise yoga and pranayama daily, and indulge in moderate exercising on regular basis.